ROTTERDAM, November 2018 – Medion and Alphacomm team up to launch new online game store on Cyber Monday. The new Lenovo Legion Game store is an initiative of Medion, a Lenovo daughter company. Mondays often get a bad rap, but for many a tech-savvy internet user, Cyber Monday is the best Monday of the year. This was definitely the case for Lenovo Legion fans on Monday, November 26th, when Medion officially launched the Lenovo Legion Game Store. A recent study by Nielsen found that 71 per cent of PC gamers prefer purchasing games as digital downloads rather than acquiring physical copies. The clever folks at Medion, recognising this fact and listening closely to their community, came up with the idea for a brand new gaming platform. 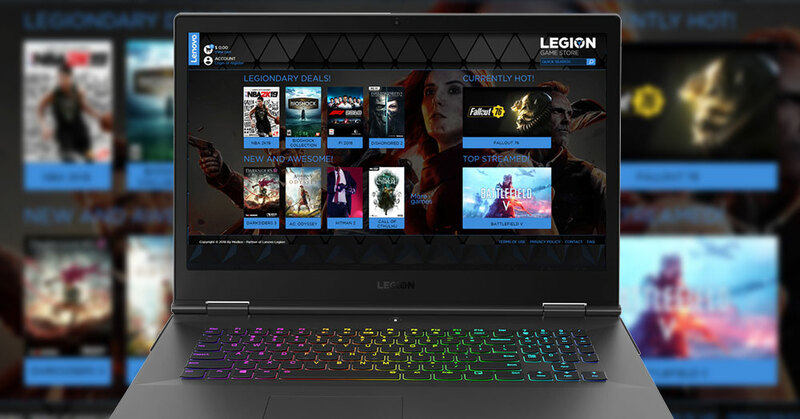 The new e-commerce site is an extension of the high-performance Lenovo Legion gaming hardware. The platform, powered by Medion’s B2B content engine, offers Legion owners and gamers, in general, a robust catalogue of over 200 games as well as exclusive deals on digital downloads of the hottest titles. The sleek online store features the latest games such as the massively immersive Battlefield V and Assassin’s Creed Odyssey as well as critically acclaimed classics like Cities: Skylines among others. Medion has partnered directly with a variety of publishers, allowing for unparalleled access to all the best games, exclusive offers and unique content only found on the platform. Stylish on the outside. Savage on the inside. The Lenovo Legion Game store is an initiative of Medion, a Lenovo daughter company. Just like its hardware namesake, the new Lenovo Legion Game Store is stylish on the outside and savage on the inside. Alphacomm developers took upon them the task of designing and developing the brand new game store. The newly launched store also makes use of Alphacomm’s secure payment processing systems. Popping the hood reveals a robust backbone that provides users with a safe shopping experience. The Legion Game Store has also been integrated with Lenovo Vantage, an app available on Lenovo devices that makes it simple to update drivers and run device diagnostics. Users will now also be able to use the app to discover interesting games. Alphacomm is a trusted global partner in all top up, reminder dunning and payment challenges. Alphacomm was founded in 1997 by CEO Huub Sparnaay on the promise of securing revenue for companies around the world. Currently, Alphacomm is striving to become the world number one in securing payments by the year 2025. Alphacomm is based in Rotterdam, The Netherlands.